The woman behind Inspire Transformation. And as you can tell, weight loss transformation is my forte. The main reason women come see me is because I’ve been there before. I know exactly what it’s like to feel frustrated with your weight, and tackling all of the roadblocks that stand in the way. I understand the difficulty of staying on track for the long-term, yo-yo dieting, and trying to keep motivation high. All the while, fighting off sugar cravings, stress, emotional eating, and feeling like a complete failure when you give in to those food triggers. Smart women come to me because I’ve been highly successful in keeping 125+ pounds off for 8 years. I have the strategies, practical how-to’s, and mind tricks to get you from point A to point B (without losing your dignity along the way). 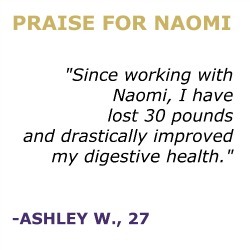 You probably came to this “about Naomi” page because you read something about my weight loss transformation story in Marie Claire, Redbook, Cosmopolitan, HuffPost, etc. In November 2014, Mind Body Green even honored me as a “Wellness Expert” and my website was listed as one of the Top 100 Health Coach Blogs of 2015 by Institute for the Psychology of Eating. I was overweight my entire life, so I know the very common ways we sabotage ourselves & I know the mind tricks to put a halt to it. I have an adaptable personality and I meet you where you’re at on your journey. 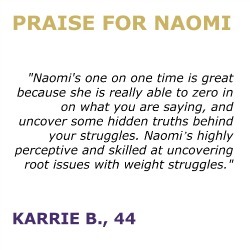 I use personality to help you discover your strengths for a successful weight loss. I know how to read between the lines of your struggles to craft an action plan that works for YOU. I overcame being a binge eater and sugar addiction on my own—and I know what needs to take place so you can do it on your own, too. I understand the internal struggle of feeling like you should love your body because the body-acceptance movement is so big right now… but still wanting to lose weight. 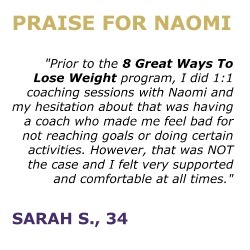 In the summer of 2013, I founded my heath coaching practice, Inspire Transformation, because not only do I have a deep passion for helping women overcoming their weight struggles, but I also noticed that no one was addressing it in the way that I do. I saw desperate women jumping on the newest fad diet and exercise bandwagons… only to fall off again and again. Research shows that only about 5% of all individuals who lose weight can keep it off for more than 5 years. One of the reasons this is true, is because 95% of us only focus on diet and exercise! I understand from my own experience that there is not a one-size-fits-all approach to transforming your health and losing weight. I understand the roles that stress, time management, relationships, spirituality, exercise, career, food, environment, and your personality play in the overall health of an individual. We cannot be healthy as individuals if one or more areas of our lives are completely out of alignment (they all affect one another eventually). If you don’t already know my back-story, I was morbidly obese for the first 26 years of my life. By morbidly obese, I mean that I weighed 145 pounds in fourth grade and it only got worse from there. I cried myself to sleep countless nights. I obsessed over teen fashion magazines and wished I could look like the girls in them. I would have given anything just to be “average size”. I prayed constantly for the miracle of a thinner body. I tried to make deals with God. So, needless to say, I was picked on a lot as a child because of my chunkiness. As a young adult, the bullying was still there, but people tended to just shout hurtful names from cars as they drove past or give me dirty looks instead. To avoid the pain of being teased, I kept to myself a lot. I didn’t like to going out unless I had to. I didn’t socialize with my friends too much. I spent a very long stretch of my life single because I thought I was too unattractive and fat to be loved by anyone. I weighed around 275-300 pounds between the ages of 20-25. Name calling and bullying was not the only pain I felt. I also suffered the physical pain of acid reflux that kept me awake at night, water on both of my knees, painful joints, extremely dry skin, acne, and always running out of breath. I tried to lose weight many times. I would succeed at dropping 20-40 pounds, but then gain it all right back after losing motivation. It wasn’t until the age of 26 that I hit another fork in the road and made the firm decision that I needed to get the weight off for good. There were many times that I was faced with uncertainty– it felt like it was impossible and would take forever, but I kept doing it and didn’t give up on myself this time. Over the course of less than a year, I lost a remarkable 150 pounds from my body. Over the course of 8 years, I’ve maintained a stable 125-pound weight loss. 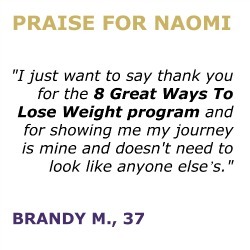 If my story resonated with you and you want to see how I’ve helped other women just like you, read praise from a few of my clients or join my free Wellness Wisdom Facebook group. You can also learn more about how I could help you through reading my free book, sign up for my newsletter, read my blog, and follow me on social media. I can help you lose your unwanted weight forever while still loving and respecting yourself. Yup, totally possible.